The problem with playing your best game in any tournament always is that your subsequent games will – naturally – not be your best. This was exactly the case with the Ateneo de Manila University Lady Eagles, who were seeking to win their first-ever UAAP women’s volleyball tournament and took a step in the right direction by defeating the DLSU-Manila Lady Archers in Game 1 of the final exactly one week ago today. In that game, the Lady Archers were cold, having returned to competition after a nine-day rest. The Lady Eagles also played what was arguably their best game of the tournament. The 23-25, 28-26, 25-23 and 25-17 scoreline was every bit as emphatic as the way Ateneo played. 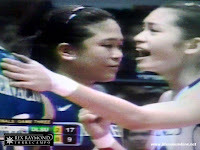 The Lady Eagles were sharp, clinical and ruthless. For Ateneo to really put pressure on DLSU, the game to win really was the second game of the final which was played last weekend. 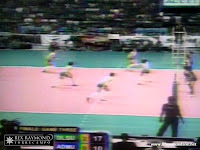 Had Ateneo won that match, DLSU’s thrice-to-beat advantage would have been reduced to just one game. Moreover, the momentum that the Lady Archers enjoyed to complete a sweep of the elimination around would have shifted in favour of the Lady Eagles. However, Ateneo didn’t; and it always needed to be at its best to turn back the defending champion DLSU-Manila Lady Archers. After their 25-23, 21-25, 24-26 and 18-25 capitulation to DLSU in Game 2, today was always going to be the day when the Lady Eagles threw in the towel to hand their great rivals the crown. Winning one game against DLSU was always a hard enough job to do in itself; but the task to do so again was made more difficult after the Lady Archers stormed back to take Game 2. Watching today’s Game 3 from the blue side of the fence must have been painful. The Lady Eagles, riding the euphoria of their Game 1 win, even managed to win the first set of Game 2. Today, the Lady Eagles did not even manage to get a grip on the game at any point; let alone win a set. 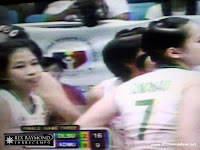 The final score – in favour of the Lady Archers – was emphatic: 25-16, 25-22 and 25-13. In the third and final set, in particular, the only rallies that the Lady Eagles were able to put together were those of error after fumbling error. 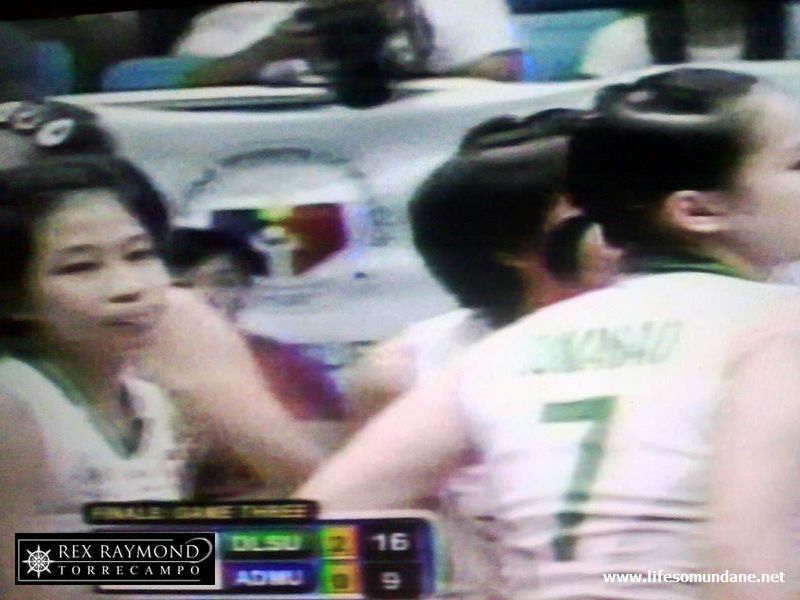 Gone was the swagger that put DLSU to the sword in Game 1. In its place was fear: the fear of a pretender trying to wrest the throne from the queen regnant – but not convinced that it could. While in Game 1 the Lady Eagles pranced around the court in joy at every kill, today even the way with which they carried themselves as the game wore on spoke loudly of their lack of self-belief. Their faces wore frowns instead of smiles. Their plays were not only predictable; these had become error-strewn. Ateneo, after all, is no UST. Even with an average team, the Lady Tigresses can always unnerve the Lady Archers; and particularly so if it is in the final. Ultimately, it was Ateneo’s lack of finals pedigree that was its biggest obstacle to self-belief; and, therefore, success. This is not, however, to take away anything from the Lady Archers who, arguably, played their finest match in the entire tournament. 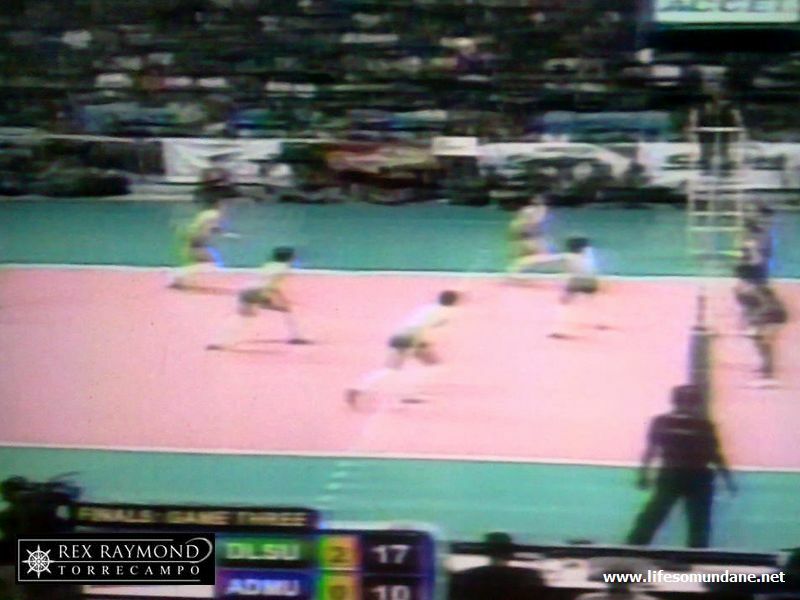 In stark contrast to their opponents – who started the final brightly and then faded – the Lady Archers started slow and lost Game 1. Then they built up an irresistible head of steam when it most mattered. 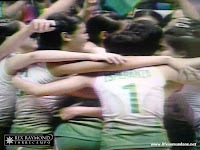 Today, the Lady Archers were at their irresistible best. Their plays were fluid; their blocking was superb; and they played like the team that wanted the championship trophy more. There could only have been one result to today’s game. Ateneo just did not show up. Did I not say that DLSU had become a wounded animal after losing Game 1? Today, the wounded animal completed the fight-back, reducing the challenge of the pretender to the throne to the ignominy of a whimper. 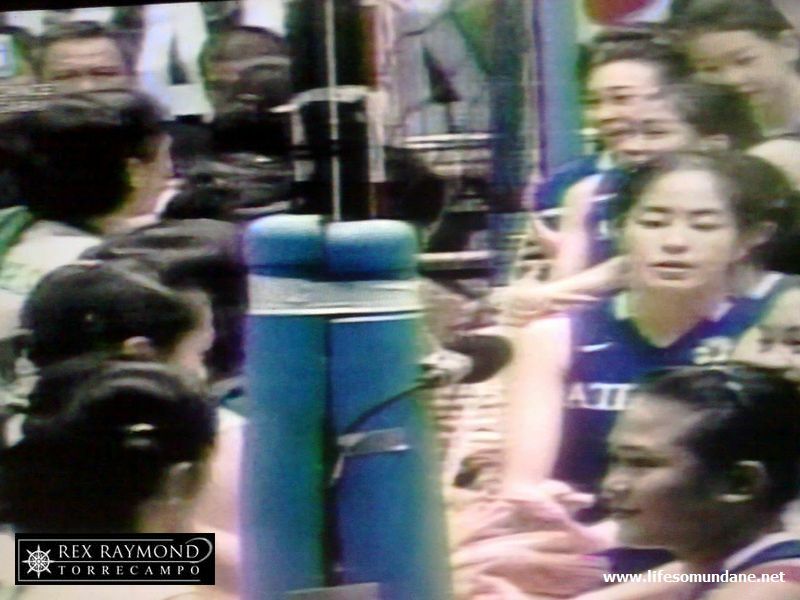 The Lady Eagles will, of course, try again next season. They are a fine team which, ultimately, could not handle the pressures brought on by attending a party that they had not been to before. 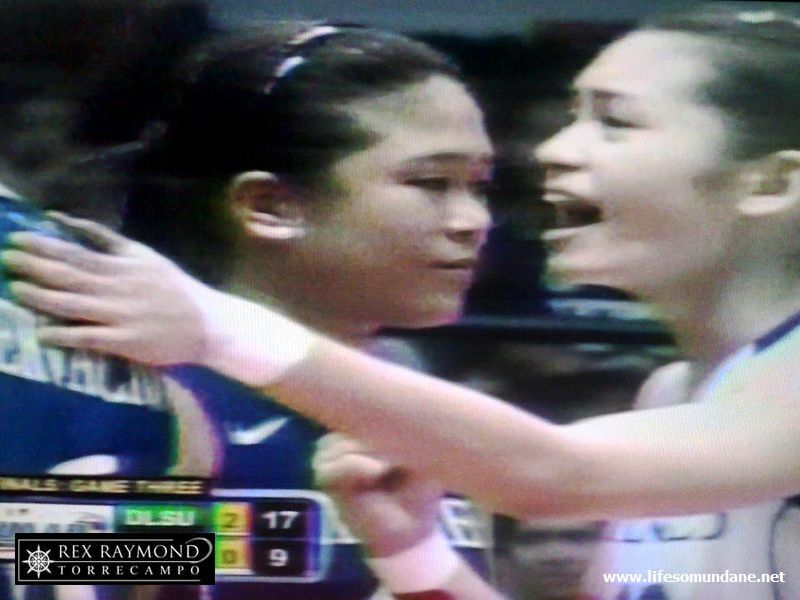 Truth be told, they would have made a fine champion team this season; except, of course, that DLSU had other ideas.